It may seem unlikely, but the key to understanding the government’s defeat over Syria is a speech delivered forty-five years ago. The Labour Party, the stop-the-war coalition and a socialist tradition of pacifist anti-imperialism of course had a role, but were not the definitive pivot on which the Commons turned against Cameron. He lost because of Tory rebels, whose inspiration lay in an address to the Annual Luncheon of the Ealing North Conservative Women’s Advisory Committee delivered on May 25th 1967. 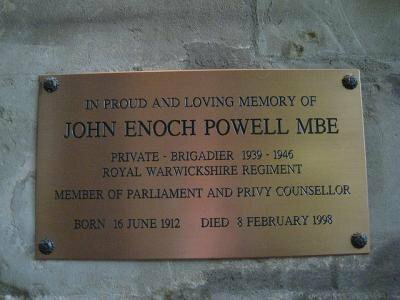 The speech was delivered by Enoch Powell. Officially, beyond-the-pale Powell has been a lingering and distinctive influence over the Tory party for two generations, as it was Powell who convinced modern Tories that social democracy is both authoritarian and unjust. In so doing, he inspired welfare reforms from Thatcher to Duncan-Smith. Tory hostility to the EU is also rooted in Powellism. The anti-immigration politics of the Conservative Party and UKIP are direct descendants of his communalist version of English ethnic nationalism. But Powell was never a theorist of the economy or of the state; his was a cultural politics of identity and feeling. For him, foreign policy was a domain in which pathological confusions of Englishness could be seen most clearly. Addressing the Conservative women of Ealing Powell diagnosed the nation’s problem as “a split personality, rent between illusion and reality, withdrawing ever and again like the schizophrenic into a dream existence peculiar to ourselves”. After empire, and with union in Europe growing, the defining political question of the age – according to Powell – was “What sort of people do we think we are?” Failure properly to address this question was sapping national confidence and effectiveness. He did not think that the great conflicts of our time (between private wealth and public redistribution, the embrace of affluence and the rejection of coarse materialism, free markets and protectionism) were expressions of principled differences, let alone clashes of real interests. Instead, he believed they were evidence of irresolution in national character, cultural confusion and existential uncertainty. The most important cause of all of this was failure to think through the end of the empire. England, Powell claimed, was trapped in a fantasy of its global significance that distracted it from taking a good look at itself. “In our imagination,” he said “the vanishing last vestiges [of empire had] transformed themselves into a peace-keeping role on which the sun never sets, whereby God’s good providence and in partnership with the United States we keep the peace of the world and rush hither and thither containing communism, putting out brush fires and coping with subversion. It is difficult to describe, without using terms from psychiatry, a nation having so few points of contact with reality”. The cure of the insanity, argued Powell, lay in national self-knowledge. And that required Tories not to be afraid of the charge of “little-Englandism” or the suggestion that the nation might become little more than a Sweden or a Switzerland, as: “A healthy, self-confident, self-knowing nation no more keeps telling itself it is great, or asking how great it is, than a healthy person keeps taking his temperature…the very inquiry is a symptom of the disease”. Perhaps Powell was onto something; nations do not have psychological conditions, individuals do. Politicians attaining high office need to identify with an ideal of leadership to orient themselves in their daunting, overwhelming task. In Britain they seem to prefer identifying with a nineteenth-century ideal of imperial martial honour than with an unglamorous twentieth-century conception of basic bureaucratic competence. Make no mistake however, Powellism offers nothing so mundane as a commitment to thoughtful and serious government (let alone a humane, practicable and successful foreign policy). It certainly does not offer a conception of the British polity suited to the twenty-first century. The Powellites think that they are hard-headed realists and down-to-earth representatives of the common people. But what they take from Powell – and what is routinely manifested in the words and deeds of Conservative and UKIP politicians, pundits and bloggers – is a satisfying self-conception. In the Ealing speech Powell argued that “all that business about ‘moulding societies’, ‘building nations’, and ‘creating worlds’ is authoritarian stuff, fit for socialists only”. The politics he proposed was no more than anti-socialism of a sort that enabled proponents to cast themselves as heroes of a civilisational struggle. “All we can do is to speak out what we feel” he concluded “…in the hope that what we speak may be what others have been wanting and are ready to hear and so may wake a chord that will reverberate”. The voice in the wilderness, bravely unfashionable in opposing the times while awaiting a future when finally he would be understood: an insight into what the right-wing thinks of itself. That is why they endlessly declare that they are ‘not allowed to say’ whatever it is about women, gay people and immigrants that they just said. They convince themselves of their sober realism, pure common sense and immunity from alien dogmas by inventing fantasies: a secret and omnipotent conspiracy of cultural Marxists or lefty educationalists; a ‘mainstream media’ poised to censor their terribly important blog comments; a Tory leadership of covert urban liberals. Cameron’s defeat – then – has little to do with serious thought about foreign policy. It is a product of an internal dispute between Conservatives and of an ideology that is primarily cultural and sentimental in nature. The Tory leadership and their backbench opponents invent policies (on the EU and the Middle East, on education and welfare) according to the needs of their ideological identity rather than on an accurate assessment of situations. This is why government has been so shambolic. It is possible that the halting of Cameron’s foreign policy will give Labour an opportunity to put some ghosts to rest and to reconsider Robin Cook’s ‘ethical foreign policy’. It might even enable Miliband to do what he and his advisors clearly would so like to do and give an answer to the question of what sort of people we now are. But what is certain is that the Powellites will see this as their victory. They will take this as evidence that both providence and the people are on their side, and as a vindication of their crusade against socialism, immigrants and the British state. Be ready for them.